"A part of the World Heritage Site - Heart of Neolithic Orkney"
Skara Brae Prehistoric Village is a well preserved Neolithic village. It contains 10 clustered houses in use from around 3100BC to 2500BC. Sometimes referred to as "Britain's Pompeii" it is part of the cluster of items on Orkney that have World Heritage status. It is one of a number of ancient villages found throughout the UK, each having unique features. 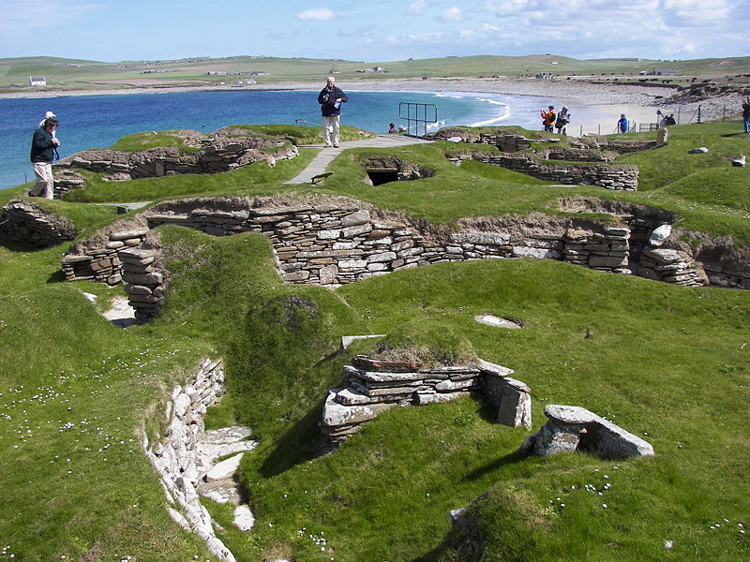 Said to be Europe's most complete Neolithic village, Skara Brae, was discovered in the winter of 1850 by William Watt, Laird of Skaill. Wild storms ripped the grass from a high dune known as Skara Brae, beside the Bay of Skaill, and exposed an immense midden (refuse heap) and the ruins of ancient stone buildings. By 1868 four buildings had been discovered and many items found in them, held at Skaill House. In 1925 another storm damaged the site and it was then put into the protection of the UK government who built a sea wall to protect it. Archaeologist Vere Gordon Childe led the first professional archaeological investigation of the site between 1927 and 1930, consolidating the damaged structures and uncovering new ones. Discovering seven stone buildings, linked by stone passageways, constituted a clustered village built out of flagstones that were naturally eroded by the ocean. These flags formed from easily worked Devonian Old Red Sandstone. Archaeologists believe that these structures were originally roofed with timber and whalebone and enclosed by middens and thatching that completely covered the habitations. Timber was scarce in the area and was likely limited mostly to driftwood, but there was a large supply of flagstones from the nearby ocean already cut to rough size by the tides. Midden, household rubbish, packed around the houses formed a level of insulation. The houses contain stone-built pieces of furniture, including cupboards, dressers, seats, and storage boxes. Each home was entered through a low doorway that had a stone slab door that could be closed by a bar that slid in bar-holes cut in the stone door jambs. A hearth centrally placed and small tanks set into the floor, perhaps for preparing fish bait. Heating and cooking is thought to have been achieved by burning dried seaweed. Seven of the houses have similar furniture, with the beds and dresser in the same places in each house. The dresser stands against the wall opposite the door, and would have been the first thing seen by anyone entering the house. Each of these houses has the larger bed on the right side of the doorway and the smaller on the left. Lloyd Laing said that this pattern matched Hebridean custom up to the early 20th century, suggesting that the husband's bed was the larger and the wife's was the smaller. The discovery of beads and paint-pots in some of the smaller beds may support this theory. Additional support may come from the recognition that stone boxes lie to the left of most doorways, forcing the person entering the house to turn to the right-hand, 'male', side of the dwelling. At the front of each bed lie the stumps of stone pillars that may have supported a canopy of fur, another link with recent Hebridean style. A sophisticated drainage system was even incorporated into the village's design, one that included a primitive form of toilet in each dwelling. The eighth house has no storage boxes or dresser, but has been divided into something resembling small cubicles. When this house was excavated, fragments of stone, bone and antler were found. It is possible that this building was used as a workshop to make simple tools such as bone needles or flint axes. The presence of heat-damaged volcanic rocks and what appears to be a flue, support this interpretation. House 8 is distinctive in other ways as well. It's a stand-alone structure not surrounded by midden, instead there is a "porch" protecting the entrance through walls that are over 2 metres (6.6 ft) thick. A rich array of artefacts and ecofacts have been discovered during the various archaeological excavations. They include gaming dice, hand tools, pottery, jewellery (necklaces, beads, pendants and pins) and richly carved stone objects, perhaps used in religious rituals. The villagers were farmers, hunters and fishermen, capable of producing items of beauty and sophistication with rudimentary technology. No weapons have been found and the settlement was not in a readily defended location, suggesting a peaceful life. Most of the artefacts are now on view. 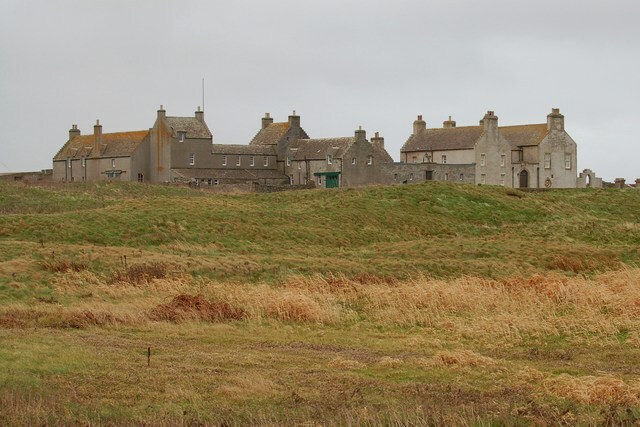 Skaill House is linked to the Skara Brae site by footpaths. A whole range of theories exist about the people who lived here. What we do know is that at the time the settlement was further from the sea. It is thought some of the village has been lost to the sea and yet more is still buried under the fields around. A glimpse back in time, with carved ivory pins 10 inches long, pottery, bows, shovels, remains of animal, fish, more recent excavations in waterlogged areas have found preserved leather, rope, and wooden handles, all from a period before the Egyptian pyramids were built, and showing how these people flourished for centuries before construction began at Stonehenge. 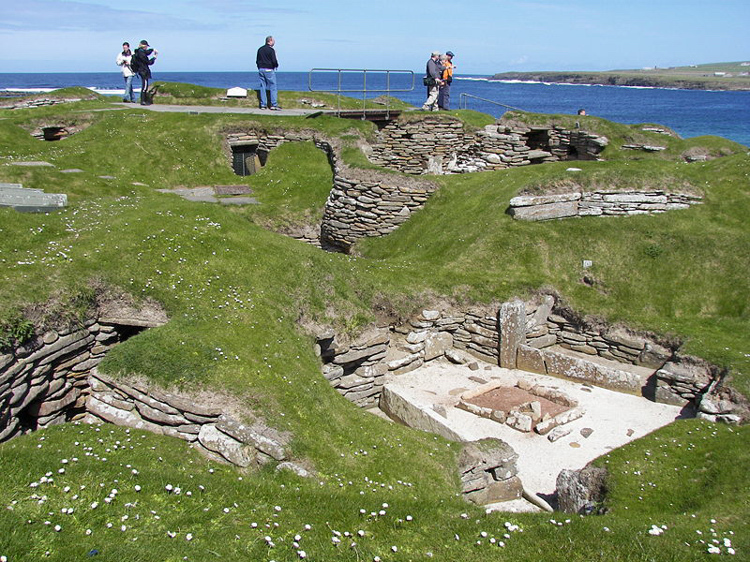 Other smaller sites of the period exist at Rinyo and Rousay also on Orkney. On the Orkney Island of Papa Westray, is a well preserved Neolithic farmstead. 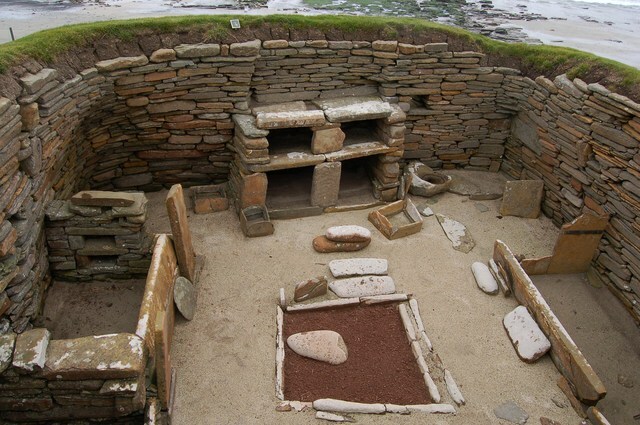 Dating from 3500BC to 3100BC, it is similar in design to Skara Brae, but from an earlier period, and it is said to be the oldest preserved standing building in northern Europe. A number of other sites still have to be explored. The monuments at the heart of Neolithic Orkney and Skara Brae proclaim the triumphs of the human spirit in early ages and isolated places. They were approximately contemporary with the mastabas of the archaic period of Egypt (first and second dynasties), the brick temples of Sumeria, and the first cities of the Harappa culture in India, and a century or two earlier than the Golden Age of China. Unusually fine for their early date, and with a remarkably rich survival of evidence, these sites stand as a visible symbol of the achievements of early peoples away from the traditional centres of civilisation. We have a number of location guides for other ancient villages around the UK look in the topic menu under Heritage, Ancient Villages. Getting there: 31km north west of Kirkwall on the B9056. See map. Charges: Managed by Historic Scotland. Free to Historic Scotland members. English Heritage members Free second membership year plus, 50% off in first year. Last tickets sold/entry: 45minutes before closing time.